I can't stop looking at the extraordinary photos by Thomas Shahan, an Oregon-based artist and microphotographer who creates amazing portraits of arthropods, including these awesome jumping spiders. His beautiful monsters don't make me run in fear, but make me smile (knowing they are tiny, that is.) In fact, some of their faces are hilarious. I just look at them and can hear them in my head saying "hey you!" "sup!" "wah?" "whatevs!" "heyheyhey, how you doin'?" "chillax dude, mkay?" and so on. I've probably watched A Bugs' Life one too many times. If you are interested in bug photography, you can start at Bugshot. 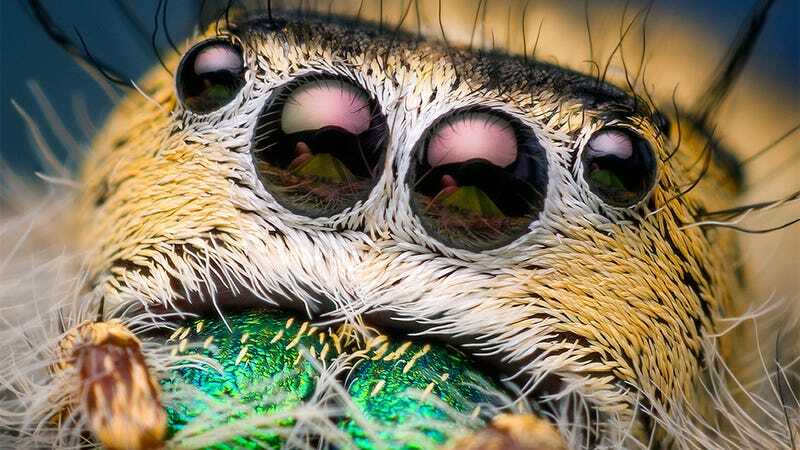 Thomas Shahan is an Oregon-based artist and microphotographer with a specialization in high-magnification photography, especially of jumping spiders. He is recognized as a master of arthropod portraiture, with pieces featured in National Geographic, Popular Photography, and NBC's the "Today Show" in addition to other magazines, television segments, newspapers, and publications around the world. With a B.F.A. in traditional printmaking from the University of Oklahoma and a fascination with the diversity and personalities of insects and spiders, Thomas offers an innovative, Do-It-Yourself approach to photography. You can see his amazing work at Flickr and his website.